Welcome back to week 4 of the $100 Room Challenge where I am making over my outdated laundry room and I can’t spend more than $100! We have an extra week in January so the reveal will be next week but I have created a faux marble subway backsplash to show you this week. Just a reminder that this challenge is created by Erin from Lemon’s, Lavender, and Laundry and I appreciate being a part of this challenge! 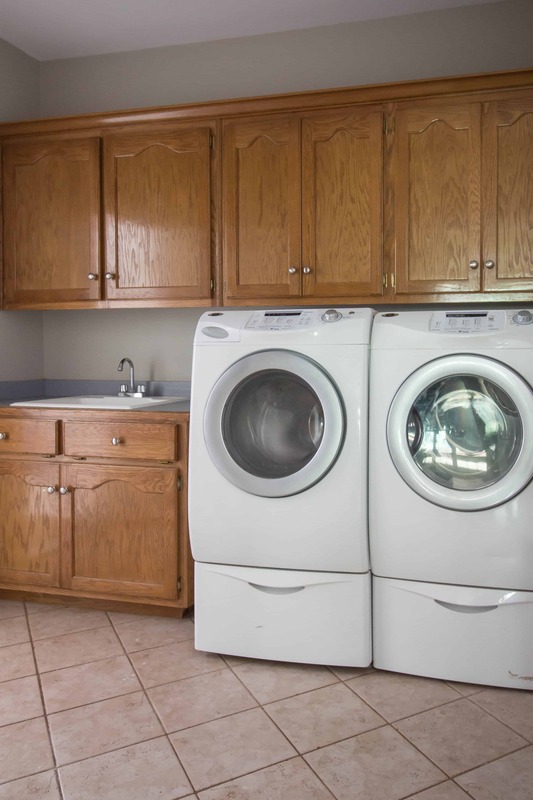 Now, let’s look at the laundry room before the makeover. My home is 27 years old and I have not updated this room except for adding new floors when we moved in 16 years ago. I needed to add something like a backsplash to the wall behind the sink but it is hard to install a new backsplash with only $100 budget. 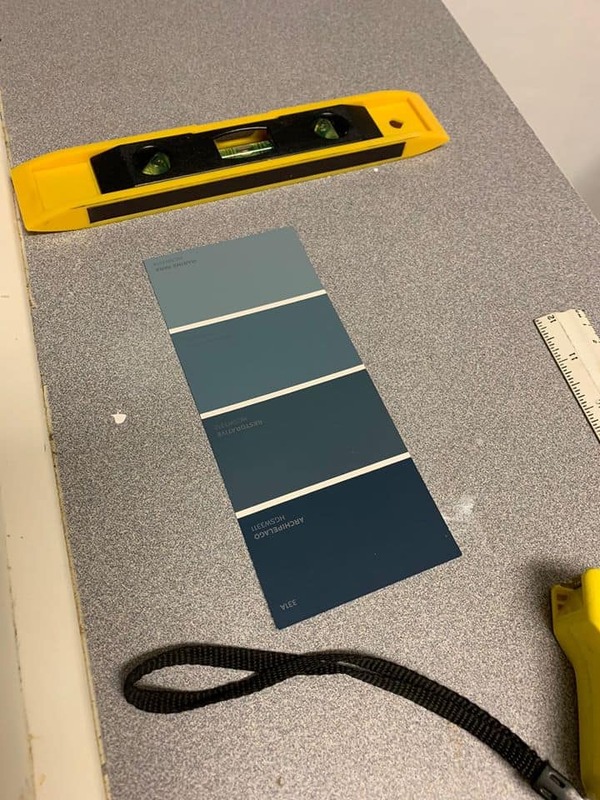 My DIY floor treatment is going to be navy and white so I need a backsplash that will go well with navy and white. 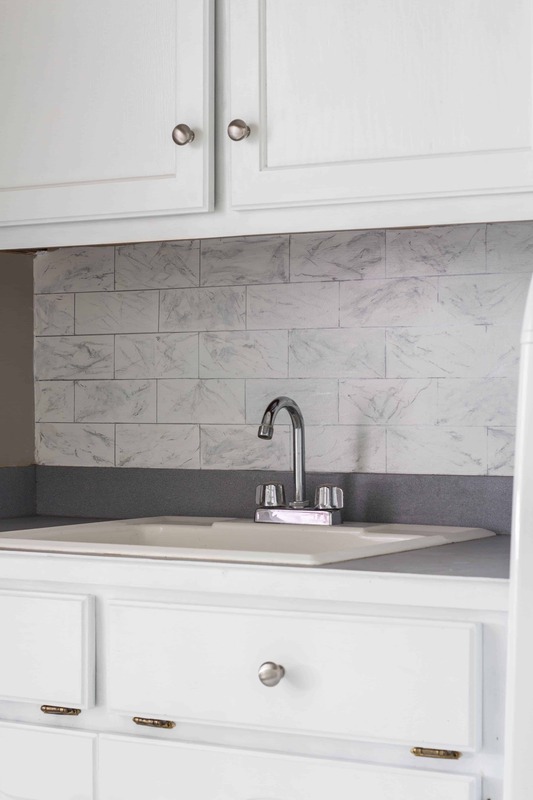 As I was searching online for ideas, I kept being drawn to marble subway tiles for the backsplash. I did paint my damaged black fireplace tiles several years ago and it looks like the real deal. No one can tell that I painted it. The best part of this project is that it is going to cost me $0 because I have the paint and feather leftover from the fireplace project. If you do not have supplies, this project will still cost you less than $10. 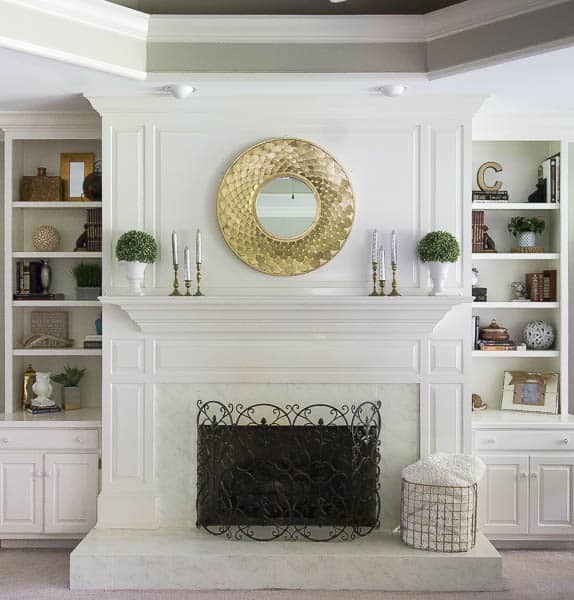 Check out the blog post for the tutorial for my Faux Marble Fireplace. The tiles use to be black and stained from the heat and the faux marble paint has held up well with no scratches. I practiced on a piece of cardboard before I started the project on the wall and I really like the way it looked. Always use a Sharpie Paint pen instead of a Sharpie permanent marker because the paint pen is much easier to cover up with paint. 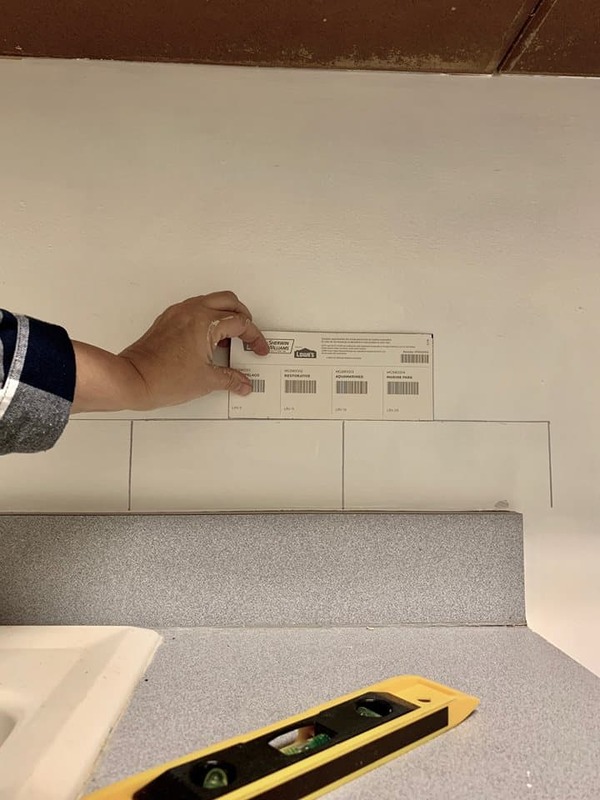 I usually draw the lines with a ruler and a leveler but I found that this paint card is the exact size of a subway tile so I used it to draw the rectangles on the wall. I also drew the backsplash behind the washer and dryer even though I didn’t really need to. If you mess up, you just paint over it and start again. It is easier to show you how to paint the marble effect but you can also visit the Faux Marble Fireplace post for the tutorial. I like to paint with a stiff feather rather than a very soft feather. You can dab your paint strokes with a cloth to soften them. After I am through, I go back and clean it up and touch it up with paint until I am pleased with the look. Painted Cabinets $0. I used leftover paint from kitchen cabinets. 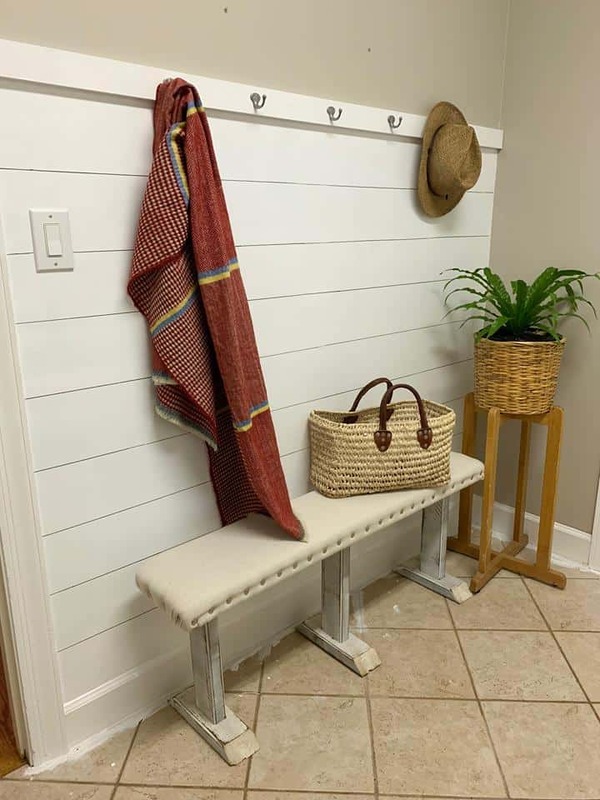 Mud Room Faux Shiplap Wall $0. I used a Sharpie that I already had and hooks from the original mirror. 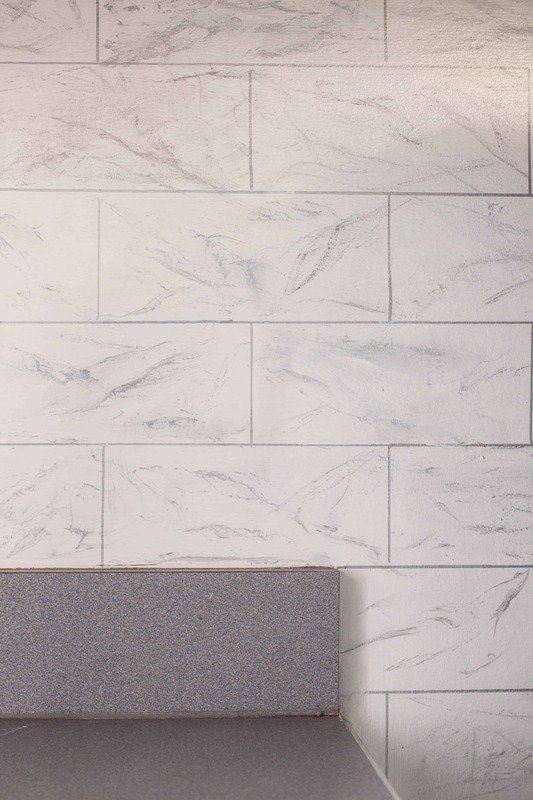 Faux Marble Subway Tile Backsplash $0. I had the feather, Sharpie, and two bottles of craft paint. I have the painted floors left to do and I plan on spending under $40. That’s amazing. I never would have thought of trying it. I don’t know if I have a good enough hand to create such a nice faux marble effect but I love it. I am amazed that you were able to do that. And BTW, I had no idea your fireplace was not real marble, I totally thought it was. Great job! I need to watch that video so I can learn how to do this! This is GENIUS!!! I am so going to be trying this!! How cool is this tutorial! I have painted faux marble before and it would have been so much easier with a feather! I can’t believe how real this looks- I would have totally thought it was the real deal! 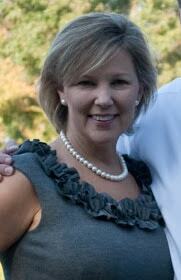 Fantastic job- can’t wait to see the reveal next week! Amazing! Best faux marble ever! Looked like your wall was smooth to begin with. Was it? 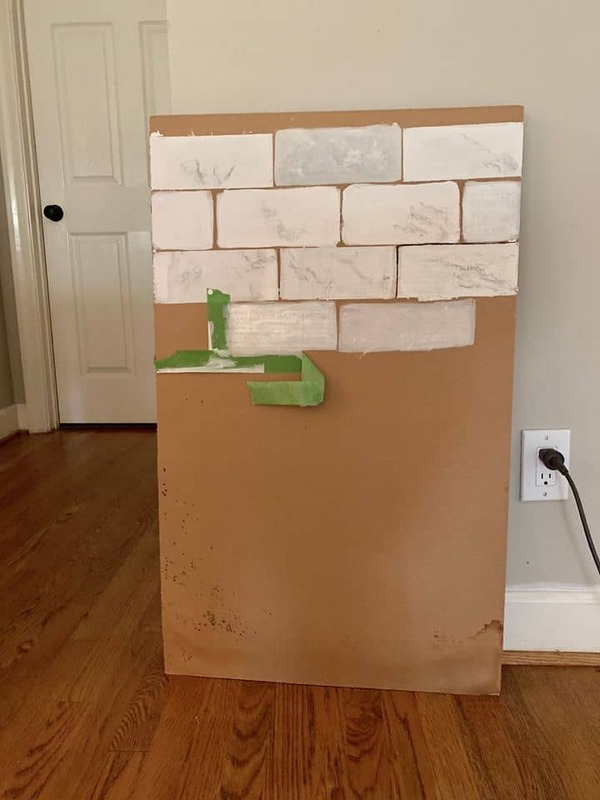 Been looking for some budget friendly backsplash ideas and your tutorial is inspiring but our sheetrock texture isn’t smooth. Sigh. Can’t wait to see your navy floor. This is so clever! I might have to try this in my kitchen!